AMSTERDAM, The Netherlands – Today Bike Europe launches its new logo at bike-eu.com and at our English and Chinese email newsletters. It’s part of our transformed multimedia identity. 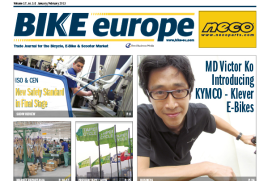 Bike Europe’s multimedia presence which changed considerably in 2012 with a new website and format for our English and Chinese email newsletters, required further alterations. It prompted a complete overhaul of Bike Europe’s identity and logo. The new logo at bike-eu.com and at our newsletters is a small but important part of Bike Europe’s changed identity. Subscribers to Bike Europe will receive the completely revamped printed trade journal later this week in their mail box. Next to a new logo and styling we bring new editorial sections; enhanced readability as well as a better ratio between text and images. Moreover, we created new advertising positions and formats which will effectively attract your attention. Or pick a free copy of Bike Europe’s January/February 2013 edition at the upcoming Taipei International Cycle Show at booth P0013 on the 4th floor of the Nangang Exhibition Hall.